Blogs: What do you do when things don't go as you planned? Over the years I've told many people to be cautious about what they read on blogs because there's a natural tendency not to talk about things that don't got to plan, or the way you'd like. 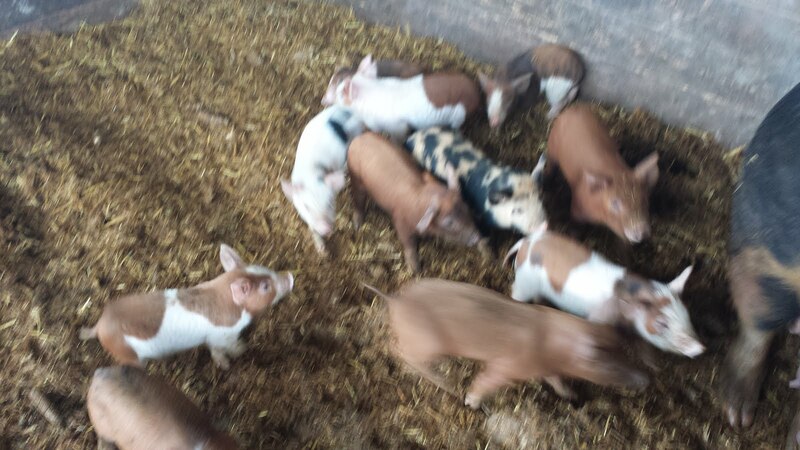 The last few weeks have been very busy; the spring piglet sales are in full swing, and I've sold 400 piglets so far, which is a good start, and generally speaking piglet sales are fun. They're cute, they are popular, people are happy to get them (and I'm secretly happy to send them away!) and it's actually a major source of revenue for the farm. But after selling a few hundred I got a call from a customer that one of the piglets she'd purchased from me had died. A short time later I heard from another customer, and then a third customer. Eventually I learned that 11 piglets had died. On one hand 11 piglets sounds like a big number, but out of 400 it's less than 3%. But I'd rather not have even 3% of the piglets not work out for the customer, and I do gaurantee my pigs, so to each customer I offered a full refund or a replacement pig, and they all chose replacement pigs. So I made arrangements and delivered the replacement pigs. It's this sort of episode that you'll almost never see talked about on farm blogs, but it's really a defining moment for most businesses - what do you do when things don't go well? It's really an opportunity to figure out what you're made of. If you think about how you'd like to be treated, you're probably like me. I'd like someone to be honest with me, tell me the truth about what's going on, and make it as right as they can, as quickly as they can. It's funny, but I've found with a 100% guarantee, even if there is a mishap or problem, like this, people trust me and continue to do business with me. I've sent one of the dead pigs off to a swine scientist to see if I can get a diagnosis of what killed it, and I've stopped selling pigs for a while to see if there are any other problems. I'd much rather handle it here at the farm than have it become a customer problem. So I'll work through it, but after criticizing other farm blogs for not showing the other side of the story, I thought I'd share this with you guys. This is what transparent farming looks like to me. I'm now past the risk of a frost for the rest of this year and so I'm working up the ground that I'll be planting this year. The field in the picture grew corn last year, and the stalks and husks are still there. 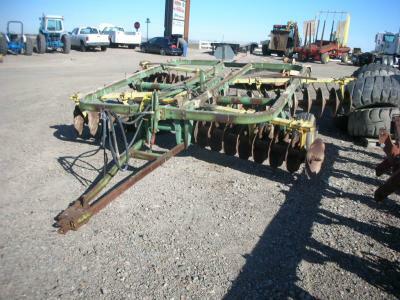 Running a disc harrow over them chops them up and increases the contact with the ground so that they break down faster. It also kills the weeds that are just starting to sprout. Then I'll wait a week or so, for new weeds/undesirable plants to sprout, and I'll go over it again with the disk to kill them, and depending on how many show up, I may wait another week for another pass with the disc. After the weeding I'll go over the whole thing with a ripping plow. A ripping plow is a 1/2" thick piece of steel in a C shape. 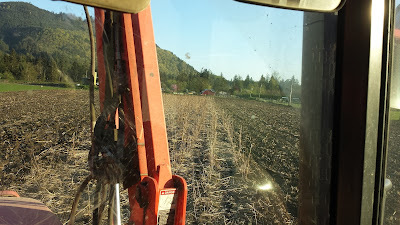 My ripping plow has 4 tines on it, spaces about 2' apart, and the tines are 4' long. You drag this plow through the soil leaving 4 narrow furrows that go very deep - to aerate the soil and improve water penetration. With the grading and ripping done, I'll do a final assesment of the soil and probably plant. I do the discing in preference to using some sort of herbicide. 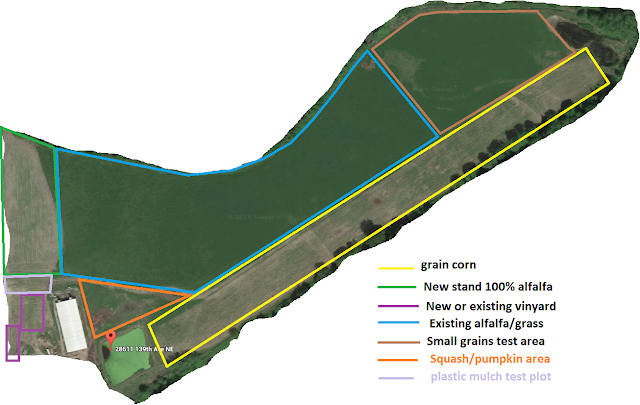 It's fast; about 10 minutes an acre, and it's pretty easy to see where you have and haven't been; easy to trac the progress. the pleasant surprise was that an area that I thought hadn't worked out last year - did work out! In the crop plan (picture below) the area that I list as "grain corn" I planted alfalfa in last year, but with the drought and conditions, I never got a stand of alfalfa that I liked, and wrote it off as a loss. A loss that really hurts because the alfalfa seed itself is $4/lb, and with the ground prep and seed costs and labor it was a loss of a few thousand dollars. Stung. So today was the day for discing, and I had just finished the 'new stand alfalfa' area, and was heading over to the grain corn, and noticed some green growth below the dead weeds from last year. What grows on your land tells you what your land is like - some plants like acid soil, some base, some like fertile, some marginal. So I got out of the tractor and walked up to the growth and... it was alfalfa! lots of it! So I walked the whole field, and while there are patches where there's no alfalfa (I'll spot-plant them) most of that area actually has a respectable stand of alfalfa in it. As near as I can figure, with the lack of rain all last summer and then cold weather most of the seed just went dormant, sprouting this spring. I put down 20lbs/acre, which is a relatively heavy seeding, and I'm happy to say that it looks good for the majority of that area. So now I've got to figure out what I'm going to do with $1900 worth of alfalfa seed that I purchased this year. Alfalfa seed this year is $4/lb - orchard grass seed is $3.70/lb -- for 30 cents more a pound, I'm planting alfalfa where I would normally plant grass this year. Just gotta figure out where that's going to be now. When I moved to this farm I had never seen the type of latch that I found here. It's called a chain hook, and it's pretty much just that. It has a small link on one end that you can attach to your gate, and a hook on the other side that has a catch in it. 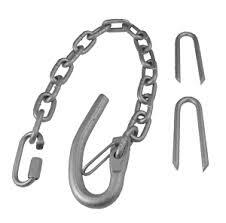 You can use the chain hooks with the big staple supplied, but I much prefer to put in an eye-bolt. It's much more secure, and given that my animals are hard on fences, I need that extra bit of strength. In the picture above I've mounted the eye-bolt on the inside of the pen. 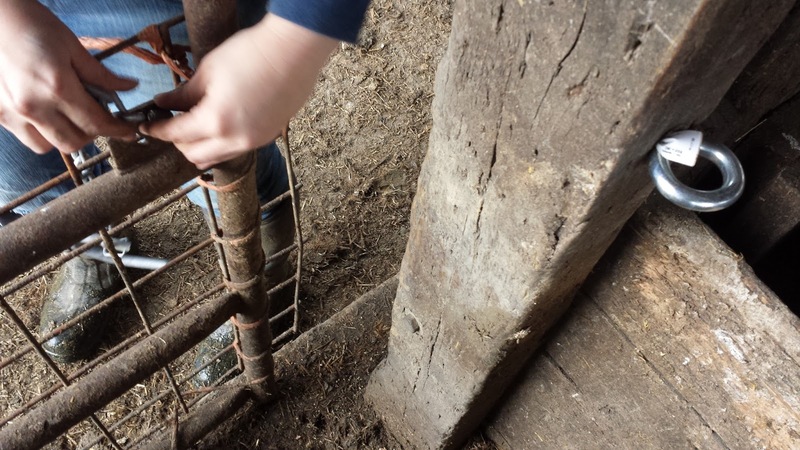 That allows me to get the gate tight shut, which is important for what I'm doing - piglets are pretty small, and I need a piglet-tight fence most of the time. The biggest reason that I like this latch is that it can be latched and unlatched with one hand, and pretty quickly. Once latched, it's impossible for the animal to unlatch no matter how much it's wiggled. So a cow that is messing with this latch will never get out. Pigs usually don't get high enough to bother the latch, but it's nice to know that if they did they'd be defeated too. These are about $6, and i purchased them online, from kencove, but I am mixed about kencove as a merchant. I ordered 10 of them, and it took about 6 weeks for them to get to me. That's a very long time. I ordered another 20 of them, and if it takes 4 to 6 weeks to get them, I don' think that I'll order from them again. I'm going to switch most of the gates on my farm to this latch.